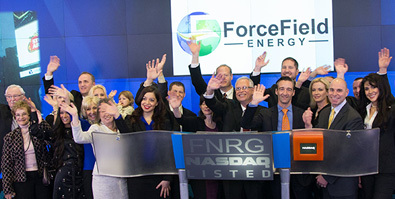 Home › Branding › Force Field Energy celebrates new name and brand on Wall St.
Force Field Energy celebrates new name and brand on Wall St.
Two days before Xmas, Force Field Energy was invited to ring the opening bell on the Nasdaq stock exchange as they ushered in their new name and logo. We were so honored to play a part in both of these creative efforts, and are sorry we never posted this news sooner. Previously this company was named SunSi, from the concepts of Solar and Silicon, as their major subsidiary was in the solar panel technology business. Of course, as they grew and added other businesses, most people didn’t get this, especially as they had major Asian subsidiaries and SunSi sure sounds like an Asian name. A common belief in branding is that if the brand is not broken, don’t change it. To which we might add, if it is broken, stop postulating and fix it quickly – even if you are a publicly listed company. With the right motivation, as this case proves, it can be a quick and painless operation.